Huge Savings on Life Fitness, Hammer Strength and more. 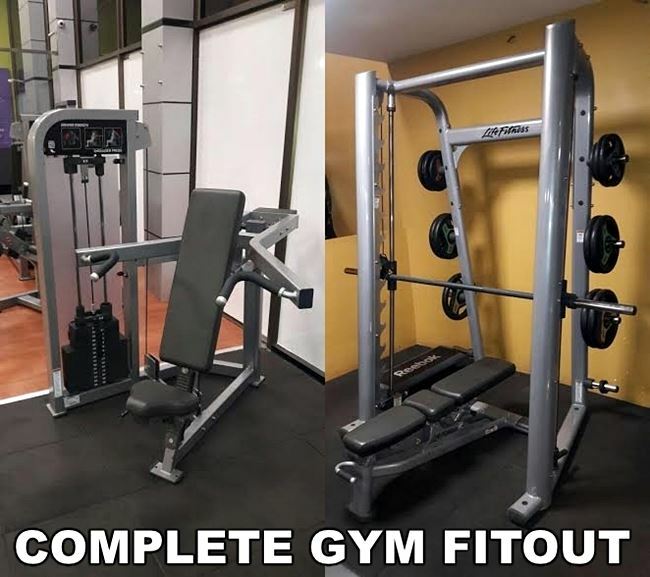 Absolutely stacks of used but incredibly well maintained and superbly presented name brand gymnasium equipment, offered at a price way lower than the true value. The equipment is presently located in India and is just perfect for anyone starting out in the fitness industry, or an established gym owner looking to replace and upgrade their tired old stock. First to see will buy, so don’t drag your heels when making a decision on this stunning package, because if you blink once, it may be gone! Loadable Barbells of different sizes and shapes. Hex Rubber Dumbbells – 1 to 10 kg (two sets). Chest Press | Leg Press | Shoulder Press | Seated Leg Curl | Leg Extension | Seated Row | Lat Pulldown | Hip and Glute | Dip/ Assisted Pull Up. Half Rack (power rack) (Hammer Strength) – With GRT attachment. DAP with both original and extra accessories. Hoist Motion Cage: Comes with a dip station, step up platform, squat rack, and 15 feet of monkey bars in the middle. Square Rubber Tiles – gym flooring 12 mm thickness, 1 sq foot x 400 tiles all black. Buy Complete Fit-Out Package online. If you are interested in the Complete Fit-Out Package for sale, feel free to enquire above.